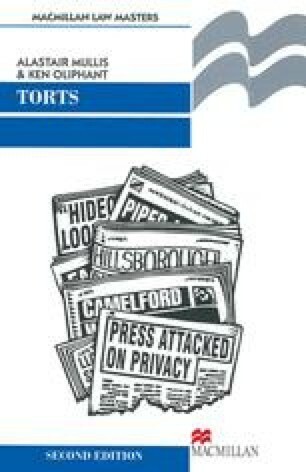 As we have seen, liability in the modern law of torts is generally still dependent on proof of some notion of fault or blameworthiness. Liability will not, subject to certain well-known exceptions, be imposed on a person unless he has intentionally or negligently caused some loss or damage to the plaintiff. Thus liability is usually based on personal fault. However, a person may incur liability as a result not only of his own acts but also as a result of the acts of another. Vicarious liability is an example of just such a situation. Where certain criteria are satisfied, the law holds the defendant vicariously liable for the misconduct of another. This is the case even though the defendant is not himself in any way at fault. In this chapter we examine the criteria required to establish a vicarious liability and look at the justifications for a rule of law that appears to run counter to two basic principles of English law, namely that a person should not be liable in the absence of fault and that a person should only be liable where his act or omission caused the injury.